This node sets the scale and offset of the terrain. The node allows you to achieve wide variation by modifying the height of my terrain. To add a Scale & offset node, right click in the Graph Editor and select Create Node > Terrain Transformation > Scale & offset. 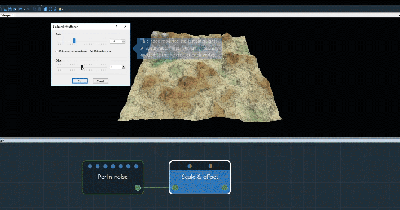 Use the Scale slider to change the scale of the terrain size. This parameter, like the Min & max height node, modifies the height of each vertex of the terrain, but it uses a multiplying coefficient. Modifying the Scale parameter even slightly drastically changes the terrain relief. 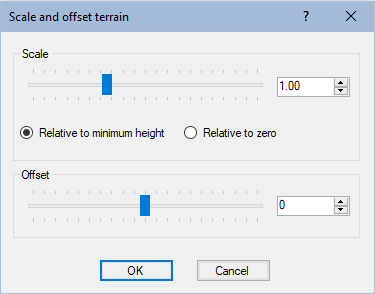 Relative to minimum height: Minimum value of the terrain heights does not change. For example, if the terrain heights are between -20 and 80 (range 100), and with a factor of 2, the heights lie between -20 and 180 (range 200). Relative to zero: Zero heights do not change. For example, if the terrain heights are between -20 and 80 (range 100), and with a factor of 2, the heights lie between -40 and 160 (range 200). Offset: Sets the positive or negative offset to apply to the terrain. This parameter repositions the entire terrain higher or lower than its initial position. Watch our Scale & offset node video tutorial. Scale Scale factor to be applied. Relative to minimum height Minimum value of the terrain heights does not change. Relative to zero Zero heights do not change. Offset The positive or negative offset to apply.